Mormon Church Publishes Essay On Founder Joseph Smith's Polygamy The Mormon church's founder was married to as many as 40 women in the years before his murder in 1844, the church acknowledged in an article posted on its website. The Church of Jesus Christ of Latter-day Saints published an essay on its website last month, acknowledging its founder practiced polygamy. 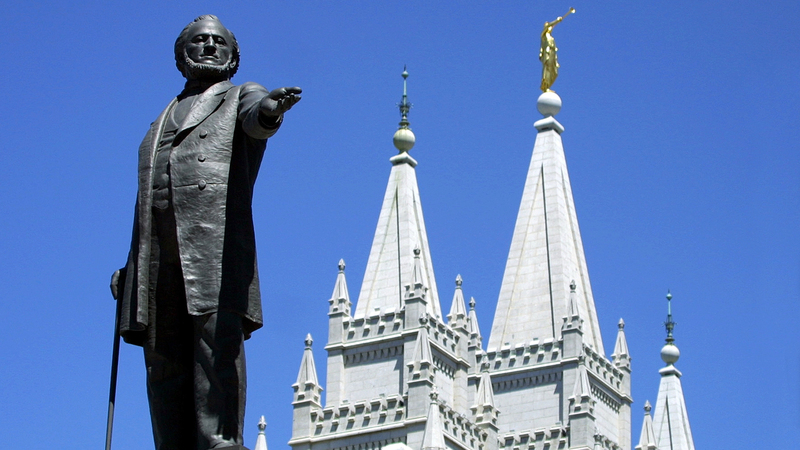 Brigham Young publicly acknowledged what Mormons call "plural marriage" after the church became established in Utah in 1852. But an article posted last month on LDS.org, the official website of the Church of Jesus Christ of Latter-day Saints, says the practice of polygamy originated with its founding prophet, Joseph Smith. Historians and others in the Mormon community have welcomed the article as a sign the church is becoming more open about its own history. Mormon historian Todd Compton, who's written a book on Smith's polygamy, says there's good evidence Smith married at least 33 women by the time he was murdered by a mob in 1844. Other scholars put the number as high as 40 or 50. Compton says some of them were already married to other men. "That was a really remarkable fact when I started researching and documenting these marriages," Compton says. "These women continued to live with their first husbands who they were civilly married to." Several of Smith's wives were teenagers when they were married, or "sealed" to him for eternity, as the Mormon practice is called. One, and possibly two, were just 14 years old. The church article says not every marriage involved a sexual relationship. Compton calls the article a good first step in what appears to be a new openness by the church to controversial topics in its own history. "It's great that people who have brought up Joseph Smith's polygamy in the past, and mentioned it to conservative family members and the family members have just said, 'Oh, no, that didn't happen, it's all the work of anti-Mormons,' they can now point to these articles and say, 'No, it occurred,' " he says. The church officially discontinued the practice of polygamy in 1890, though another article on the church website acknowledges that it continued as something of an open secret for some time after that. Today, Mormons who affiliate with offshoot groups that still practice polygamy risk excommunication. Some Mormons argue the doctrine of polygamy Smith avowed is still part of Latter-day Saint teaching. Feminist Mormon activist April Young Bennett points out that men who are widowed or divorced can still be sealed in Mormon temples to a second or a third wife — something critics call spiritual polygamy. Women don't have the same privilege. "This is a theological problem that needs to be resolved at the highest levels of church governance," she says. "And I really don't think it will be resolved until women are part of that highest level of church governance." Bennett is a leader of the group, Ordain Women, which has been urging church leaders to consider allowing women to receive the LDS priesthood. The website Mormon Women Stand is more traditional and supportive of church leadership. Jelaire Richardson is a blogger on the site. She says her faith in Smith is broader than just one controversial topic. "I don't know of any other woman, personally, who's ever been asked to be OK or be at peace with polygamy, 'cause it's a hard thing," she says. "But personally, when I've prayed about Joseph Smith, that's how I feel I got my answer." The church's public relations department declined an interview for this story, but it did issue a statement this week pointing out that the material in the articles on polygamy has been available from other published sources for a long time. It says the new articles are meant to be a resource for members and to counter misinformation about Mormon beliefs and practices.